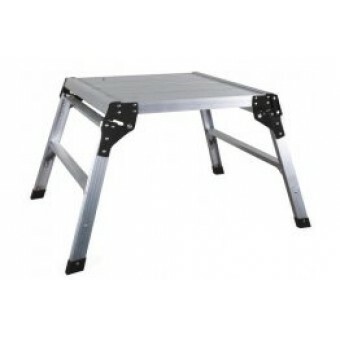 A unique work platform which is ideal for painting and decorating. Manufactured from aluminium, the 'Hop Up' is lightweight and easy to move, sturdy and safe to use, with a working load of 150kg. The folding legs provide for space saving storage and easy transportation. Conforms to EN131 standard. The S042402 (600 x 600mm square work platform) is now the preferred choice of Health & Safety officials and often the only size allowed on sites.